Hopkins, Klitschko: When Dirty Fighters Play by their own set of Rules! All of you know that in the past I have always praised both Wladimir Klitschko, and Bernard Hopkins for their work ethic, fighting skills, and accomplishments. In the past they were somewhat deserving of said praise even if it was interspersed with shades of holding, rabbit punching, pushing on the head, and just generally speaking dirty fighting. Hopkins had always employed this as part of his style, while Klitschko only began doing so post-Sanders knockout while working with Emanuel Steward. For a time both showed less of these illegal maneuvers and more pure skill in some of their more brilliant victories. However, with Klitschko’s win over Alexander Povetkin, and Bernard Hopkins victory over Karo Murat it has become clear that both of these superstar fighters are now simply ignoring the rules of boxing completely. 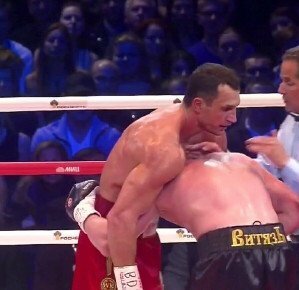 While Klitschko didn’t initiate as much holding in his fight as some suggest (simply because Povetkin ran straight into Klitschko’s body to get inside on more than one occasion) he did enough of it to warrant not only point deductions way earlier in the fight, but arguably a disqualification. Max Kellerman’s observation that Klitschko was pulling a Ruiz with the jab and grab offense was spot on and there is no doubt that a competent and objective referee would not have allowed him, despite his status and longevity as champion, to get away with it. Of course that isn’t to say Povetkin wasn’t blameless himself because as a fighter when he realized the referee would allow Klitschko to do this he should have fought dirty back to make Klitschko understand it wouldn’t be that easy because he would fight the same illegal way if the referee would be complacent. A fighter has to be honorable when the referee can dole out justice but at some point he has to make his own if only for the sake of the match being a truly fair fight. The showtime commentators even claimed Murat was getting frustrated and was attempting to retaliate for the things Hopkins was doing. While that is what it seemed like the truth is Murat was only trying his best to make the fight fair since not only was referee Steve Smoger (a generally speaking decent referee) not reacting to Hopkins breaking the rules he was actually physically assaulting Murat for trying to react in the same manner. If ever there was an unfair fight with a two on one assault it was the combination of Smoger and Hopkins double teaming Murat. Of course the big name fighter always has an advantage with the rules because it is his name that sold more tickets and that fighter winning gives all future opponents, promoters, referees, and judges a nice guaranteed pay day, or other perks (because the big established name is like a well known brand to fans like say “Tyson”). This is why Murat, and Povetkin, and many of Muhammad Ali’s former opponents praised them to high heaven even though we all know these guys never got a fair shake when it came to the rules. Just because something is the way it is does not make it right or fair. As fighters both Hopkins, and Klitschko should admit to themselves their most recent “wins” were accomplished with illegal tactics and both they and the sport of boxing are simply better than that. Next boxing news: Left-Hook Lounge: Hopkins/Mayweather Legacy, Why We Won’t See Quillin/Rosado II, & Deontay Wilder’s Next Step!!! You are here: Home / Boxing News / Hopkins, Klitschko: When Dirty Fighters Play by their own set of Rules!